Re-inventing the space formerly known as MIX, the 63rd floor of the Delano has been transformed from it’s signature contemporary all-white design, into Alain Ducasse’s new 2.8 million dollar restaurant/nightlife duo, Rivea and Skyfall Lounge. The venues have only been open for a little more than a week, but the reviews and critics are nothing short of spectacular. Rivea and Skyfall are led by one of the worlds most influential chefs, debuting an inviting and fresh cuisine inspired by the casual, yet elegant Mediterranean coast. At Rivea, the aperitif is a way of life. As presented, the diners will certainly be curious about the new cuisine and fresh tastes. Offering this blend of a warm inviting atmosphere with small plates and camaraderie; Rivea gives patrons the chance to try it all while enjoying time amongst co-workers, family or friends. Since working together on other projects, Alain Ducasse eagerly invited world-renowned French-Canadian pair Patrick Jouin and Sanjit Manky to help him create the new atmosphere for Rivea and Skyfall. Taking inspiration from the predominantly French-Italian menu, Jouin and Manky have transformed the Rivea space into maritime palette featuring stunning blues and yellow accents, giving patrons the feeling of dining on the shore. Looking for something more secluded? The 50-seat private dining room has incredible views of the area from breathtaking floor to ceiling windows. This 200-seat venue can offer accommodations for a large or intimate event. Focal points include beautiful fabric and leather chairs, giving the restaurant a contemporary touch, and an iconic “Wave Wall”, a mural created from hundreds of glass squares, arranged to emulate the Mediterranean ocean waves. In the center of the dining room, Rivea steals attention with a custom-designed glass chandelier; made up of 15,000 hand blown glass spheres, from Murano, Italy. 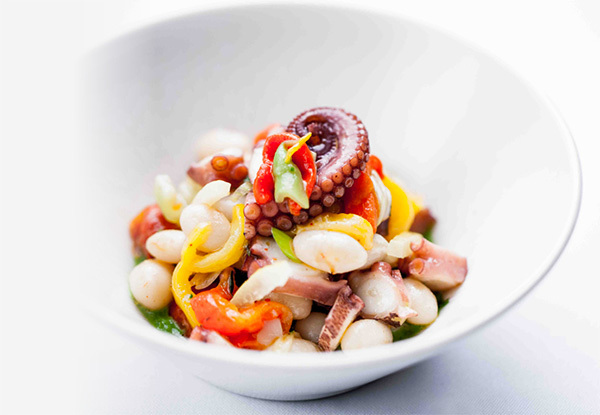 Drawing influence from the quaint food markets of Italy, Michelin rated Alain Ducasse and Executive Chef Bruno Riou are focused on fresh and simple flavors created with the best West Coast, seasonal ingredients. At Rivea, you can expect to find a house made pizzette, indulgent pastas or signature dishes such as the Crispy Socca or the Stuffed Baby Vegetables. Delicious desserts include Lemon Shortbread and Limoncello Sorbet. 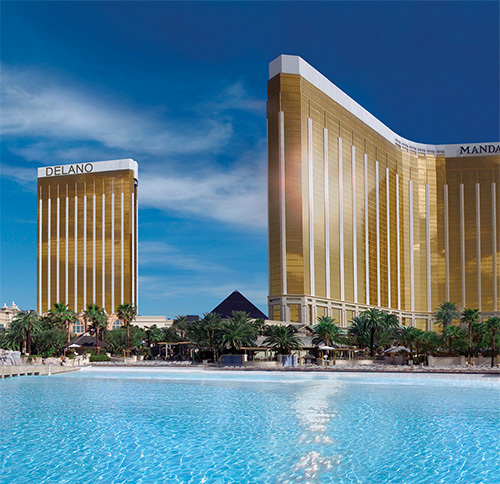 “Rivea will bring the soul of the French and Italian Rivieras to Las Vegas locals and visitors alike….and at the same time, it’s sparkling and relaxing, secret and select, chic and low-key,” said Ducasse. Skyfall Lounge is located adjacent to the Rivea and hosts a nightlife experience that evolves as the night goes on. After 10pm the house DJ spins electronic and dance music for guests. The space is inviting and makes it possible for guests to watch the beautiful desert evening unfold while sipping champagne with the moon and stars overhead. The space has been redesigned into a lounge with multiple spots to catch a view of the stunning Vegas skyline. It has an outdoor patio, so you can get some fresh air, and the decor simulates the beauty of an every changing sky with beautiful purples, deep reds and honey-gold accents. 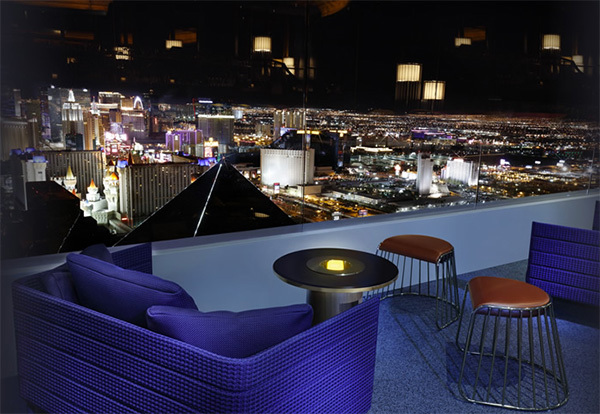 With 180-degree views of the Las Vegas city below, Skyfall Lounge starts off strong with a list of handcrafted drinks and spirits from the US as well as domestic beers and wines. Light fare from the restaurant Rivea will be available and include items like delicious crispy Tigelle sandwiches or Squid Fritters with pink dipping sauce. The cocktails at Skyfall lounge are rooted in the traditional structure, but are being reinterpreted to offer patrons new, contemporary mixing technique and unexplained flavor profiles. The menu is able to help you select a drink that will suit your mood – or the mood you’d prefer. Some of the cocktails are enticing; Golden Hour cocktails, for example, being inspired by twilight. Categories also include things like ‘Effervescent’ and can include sparkling wines and ciders. The syrups are all made in house, and ice comes any way you like it. The cocktails here are flash carbonated to order, never flat or stale. Guests can even ask for “Old-Fashioned” service, which includes bottle service of aged spirits such as rye, bourbon, Scotch, Cognac and more, which are served with sugars, bitters, fruits, rocks and glasses. Other services include non-traditional experiences you’ll enjoy such as fresh lemon juice sweetened with honey or fresh lime and mint syrup. Visit As Soon as You Can! 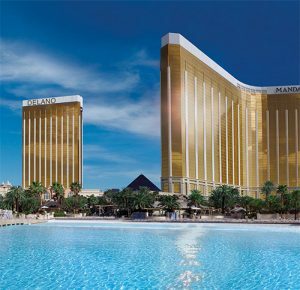 Hotels, nightlife venues, restaurants and more; they all come and go on the Las Vegas strip, the epitome of entertainment in the world. With such careful planning and stellar first week reviews, Rivea and Skyfall Lounge should certainly make the list of things to do while you’re here in Las Vegas! If you’re interested in viewing menus or drinks, contact us! In addition, The Delano Las Vegas has recent undergone many changes as well, and is now a new all-suite, smoke free luxury hotel. 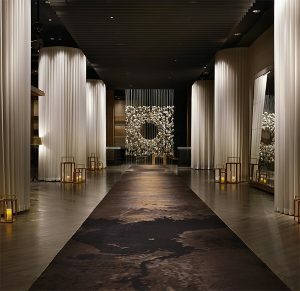 Formerly known as the Hotel at Mandalay Bay, Delano has been revamped with beautiful social spaces and luxurious spas.